Let us discuss which overtone numbering system would be the best to agree on. Which numbering system for overtones would You recommend to become an international "ISO-standard" ? 1. This I would call "Scientific system" because it comes from Physics. Overtone Analyzer (OA) uses it. Each number means "the number of times the frequency is higher than the base freq.". So, the 1st "overtone" is actually the fundamental tone, because it is "one times the base". We probably all know this physics of overtones. a) Computer programm OA uses it and some composers too. b) Every octave (from fundamental) is seen on the first sight, because TWO times anything = anything just octave higher. Octaves from fundamental: 2, 4, 8, 16. Also octaves between overtones are obvious, for example: 3, 6 , 12 (perfect fifths) or 5, 10, 20 (major thirds). a) Not so "friendly" for Musicians to learn and to read them. I can see in those numbers the intervals - fifths and thirds etc... on first sight because I was no musician when I have learned them. But I know other people having problems during learning it comming from interchanging (perfetc) fifth with 5th overtone, sixth with 6th overtone etc... But we still have some that are "the same" in interval: 7th overtone = (minor) seventh, 8, 9, 10, 11, 12th ovt.have pretty much the same interval as their numbers are. 2. This I would call "Basic System" (or "Emergency System" - this would be good if we would have no other to choose from. Thats why I call it also "Emergency System"). Thats why I have created this discussion. To help to prevent those "possible conflicts between Ovt.numbering systems" in the future. If anyone finds another system, please post it here so we can discuss it. Started by Filip Rydlo. Last reply by Skye Løfvander Sep 5, 2011. Started by Marco Tonini. Last reply by Christopher Oct 10, 2010. Started by Dave Seidel. Last reply by Dave Seidel Jul 22, 2008. Started by Filip Rydlo. Last reply by Filip Rydlo Jul 22, 2008. 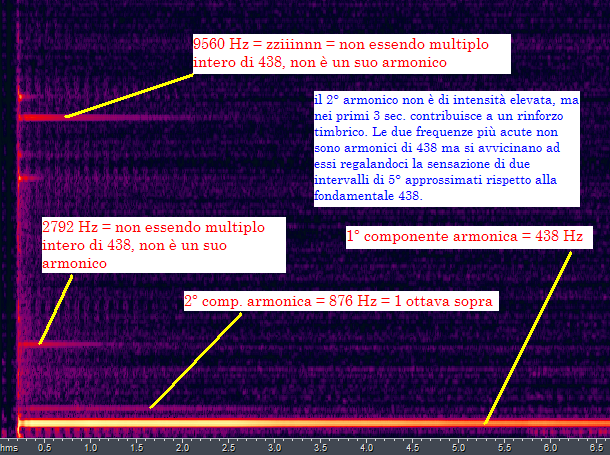 Your description is right and clear, partials, overtones, harmonics, but in Italy we use only PARTIALS and HARMONICS terms. For us to say PARTIAL or HARMONIC it is the same, then we can explaine if PARTIAL is harmonic or inharmonic in relation with an audio spectrogram. I would also call it 5th harmonic no matter what. It's not that simple always. There might be different definitions of some of our terms depending on who you're adressing, a musician or a physicist. Most overtone singers agreed on the physical terms, as I found in this forum. But some musicians have a different approach. Compare the definitions of a tone, for instance (de/wikipedia). For musicians it can be a lot of things from sound till pitch. In physics it's a sine wave. Partials - are the pure tones (sine waves) a sound is composed of, including the fundamental. Partials can be harmonic or inharmonic. The fundamental is counted as partial no. 1. Overtones - are the partials that are higher than the fundamental. Overtones can be harmonic or inharmonic. The second partial is counted as overtone no. 1. Harmonics - are partials with integer multiples of the fundamental frequency. The fundamental is counted as harmonic no. 1, similar to partials. Every harmonic is a partial (but not necessarily vice versa). Usually the numbering of partials and harmonics are similar, since in most of the cases there are either harmonic or inharmonic in most of the cases. I am not sure about sounds composed of both inharmonic and harmonic partials, as happens with some gong sounds. You'll probably agree on calling the harmonic partials 'harmonics'. But what about the numbering? It could happen that there are some inharmonic partials first and then comes a major third two octave above the fundamental. I would tend to speak of it as the 5th harmonic even if it's the 3rd partial. What do you think? I thank you both for your nice comments. I need to say only this: I will never substitute numbers of overtones! I need them to sing from the paper. I am only trying to add some kind of notation for them, so that professional choir-masters / conductors can cunduct an overtone-choir music and literally see the harmony without the need to learn the numbering system for overtones. So, they are able to identify and correct mistakes. That seems handy for notation, except that the fundamental is not overtone 1. It's not an overtone, but it is harmonic 1 (though I'm not certain you meant it that way; perhaps it's a language thing?). I think that is the most common source of confusion. We have definitions, and as long as we understand them the whole issue of numbering should be very simple. for me its the easiest to work with fundamentals in normal classical notation and to have the overtones only as numbers, where the fundamental is nr. one. It's easier then having everything in classical notation and having no numbers. in the discussion "Let's discover Optimal notation syst. for musicians"
1st one is: "Brother Jacob"
In first one: We hear 11-th overtone LIKE if it was "F"
In second example : We hear 11-th overtone LIKE if it was "F-sharp"
I like Thy comment very much, Jan.